We’ve learned a lot about post traumatic stress disorder, or PTSD, especially more recently from soldiers returning from combat, who face difficult physical and/or mental challenges upon returning to normal life. We hear less about the good that might result from a traumatic experience, even though the idea is not a new one. Since the early '80s, two Charlotte psychology experts have been pioneers in research of post traumatic growth - the idea that positive change sometimes comes from a traumatic experience. We’ll meet these experts to talk about what they’ve learned, the research on PTG that’s still happening at UNC Charlotte, and how the theory they had many years ago is now receiving more attention. Dr. Richard Tedeschi, Ph.D - professor of psychology at UNC Charlotte. 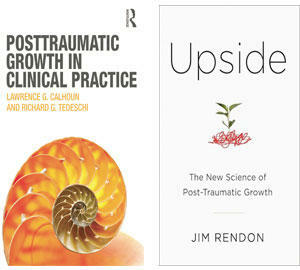 He co-wrote Posttraumatic Growth in Clinical Practice with Dr. Lawrence Calhoun.